Our premium quality, Krill Oil 500mg capsules are a great source of Omega-3 fatty acids. with each capsule providing 60mg of EPA and 27.5mg of DHA. These important fatty acids have cardioprotective benefits and contribute to brain function and joint mobility. Krill Oil comes from shrimp-like crustaceans and is a good source of EPA and DHA Omega-3 fatty acids. Krill oil has become popular because its Omega-3 content can be easily absorbed by the body as it is highly bioavailable. This superior bioavailability means that the health benefits of Omega-3 can be experienced with a lower level of EPA and DHA than other Omega-3 sources. 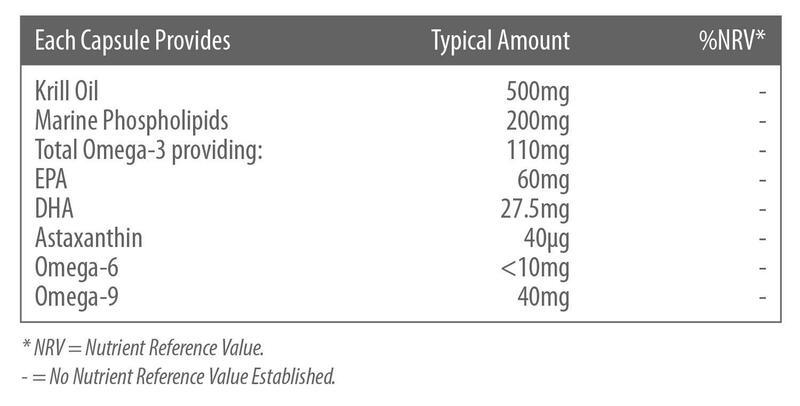 This is why these krill oil capsules have a much lower EPA and DHA content compared to other Omega-3 supplements. What are the health benefits of Krill Oil? > The normal function of the heart. > The maintenance of normal brain function and vision. > The maintenance of normal blood pressure. Krill oil also contains Astaxanthin which is a powerful antioxidant that helps protect cells against oxidative damage. Astaxanthin is the component of krill oil which is responsible for the deep red colour. Krill Oil (Fish), Capsule Shell (Beef Gelatine, Glycerine).